Monitoring Posidonia on Arki island. A 3D WebGIS application for ecotourism in Greece. Satellite images are a great tool to support people operating in the field of the management and safeguard of natural areas and of territorial planning. They represent a precious information source for the development of a sustainable eco-management. Specifically they enable users to run more efficient monitoring of sensitive areas and the evaluation of human and natural changes on the territory. The specific project is about monitoring Posidonia Oceanica seagrass beds in East Greece and specifically the area around the Arki island, by using satellite images (IKONOS, LANDSAT, MERIS). The area of interest is included at the under creation Marine National Park of the North Dodecanese. The user is Archipelagos, the Institute of Marine and Environmental Research of the Aegean Sea, a non-profit, non-governmental, environmental organization. Archipelagos action combines scientific research into the biodiversity of the marine and terrestrial environment of the Aegean Sea and islands. 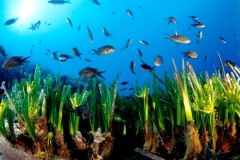 The Posidonia sea grass beds are of fundamental importance for the productivity of Mediterranean marine ecosystems and fish stocks, however their status can be assessed with great difficulty as there does not exist any efficient monitoring tool or method. Satellite images where sea grass beds are depicted, is expected to make a great tool for the conservation of marine ecosystems, but also for the monitoring of fishing activities, as although EU legislation defines, that no fishing activities can be carried out in areas where there are seagrass beds, at present this law still can not be applied, as there do not exist maps of where these seagrass beds actually are, and therefore fishing zones and no-fishing zones cannot be defined. The user Archipelagos Aigaiou aimed at developing an efficient method for the monitoring of seagrass beds, and specifically Posidonia Oceanica, by using satellite imagery as a tool. This will lead to the development of a tool to quantify sea grass meadows size and density. The project has been applied in a pilot phase in the region of the, under construction, National Park of the North Dodecanese, with the aim at a later stage to have further application in other parts of the Mediterranean. b) Development of a WebGIS system for the representation of the environment and the promotion to a wider target of users. Planetek Hellas in cooperation with Archipelagos Institute has developed PARC-Archipelago, a system designed to support sustainable eco-tourism applications and therefore be directly promoted in support sustainable monitoring systems needed to be positioned in regions where there are seagrass beds. PARC-Archipelago is based on Planetek''s Cart@net technology applied on PARC Service, a European Space Agency funded project realized in Italy. The system is designed to support natural park management and promotion using EO data and web mapping technology. PARC service is now a tool used by main Italian Natural Park "Parco delle Cinque Terre" in Liguria Region. The PARC application is centred around the monitoring of Posidonia seagrass to become part of a 3D WebGIS for below sea level use. This service aims at facilitating the representation of the below sea level environment (thematic maps of submerged vegetation), so that information related to the posidonia seagrass beds can be included, managed and promoted. The system includes data of different sources and type, namely: mapping trough EO in clear and shallow waters, geophysical data, e.g. temperature, oxygen concentration etc. plus general information such as pictures. The 3D WebGIS ensures a wider use of the system by a module to implement visualization fully integrated into Google Earth.